Laure Latham finds an unlikely confluence of public utilities and literary connections in a pair of stones. Kensington Gardens is not all royalty, ducks and merry-go-rounds. The park is crisscrossed by invisible lines. Whether you believe in them or not, fairy stories run deep in the roots of its plants. These two stones hold the key to one of its quietest secrets. To find them, I took a walk with my girls to a small grassy patch in the park by the Round Pond. As good a family picnic spot as any, it has something that other grassy patches do not — two worn-out stones under an ancient tree. Maybe a chestnut tree? I did not pay attention. I was too fascinated by the stones, for I’d been looking for them on a gravestone hunt, and it’s all JM Barrie’s fault. What JM Barrie wrote had to be somewhat true. A master at weavings fiction into facts, he lived around the corner and probably knew every single tree on Latin-name terms, since he named an actual weeping beech where Peter fell asleep after he escaped to Kensington Gardens from his nursery. A couple of feet high and weathered around the edges, the stones bear inscriptions — something like W. St M. and 13A P. P. Were these the graves of Walter Stephen Matthews and Phoebe Phelps? The stones seem ancient; Celtic runes would not look out of place upon them. Could these really be graves? The thought of visitors walking over long-decayed bodies sent gothic shivers through my spine, echoed by my 9-year old to whom I’d just summarised Peter Pan’s bit about the graves. We did leave, but the stones stayed on in my mind. I needed to have a heart to heart with JM Barrie on their exact nature, fairy folk aside. In comes Google and a few phone calls. It turns out that JM Barrie really didn’t want to grow up, any more than Peter Pan did. Both stones are boundary markers. One marks the limits of Westminster St Margaret (W.St. M). The other sets the limits of the Metropolitan Borough of Paddington, or the Parish of Paddington (P.P.). Though one reads 1900, both date back to 1841 but were re-inscribed in 1900. They definitely existed when JM Barrie turned them into children’s graves, dug at night by Peter Pan to bury poor little souls claimed by evil fairies. In fact, they were part of an invisible straight line that marked the parish borders in Kensington Gardens, running northwest to southeast. 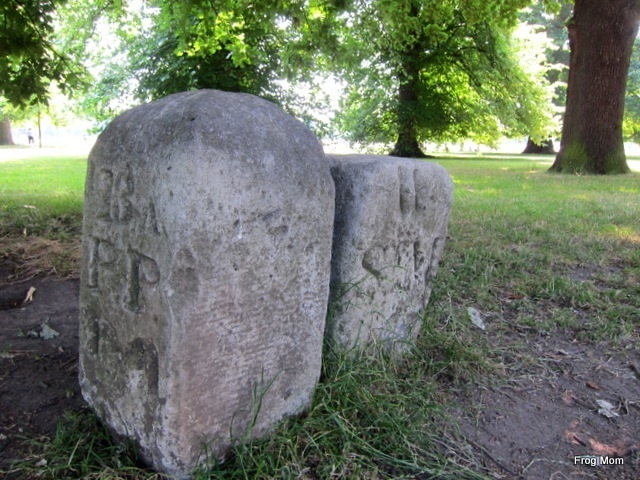 There are hundreds of these boundary markers in London — formerly wooden posts and gospel trees that were replaced by stone markers and metal plates over time. Pre-dating accurate maps, they helped local governments take charge of civil services — street paving, sewage and lighting— by delimitating communities. The oldest ones are said to be on Carey Street near the Royal Court of Justice, and other markers can be found in the royal parks. Once you become aware of them, you'll spot them all over London. Yet none will be half as romantic as mine, with fairy twinkle lights and a boy dancing on graves to brighten up the recently deceased.